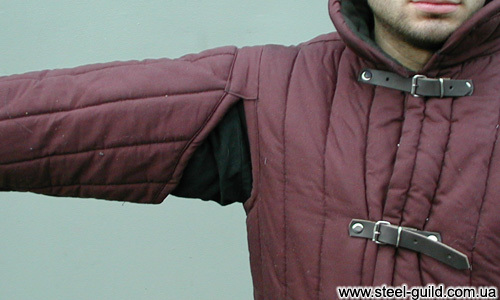 The gambeson, also known as the aketon or arming coat, is a kind of padded armor. The term gambeson is a loan from Old French gambeson, gambaison, originally wambais. 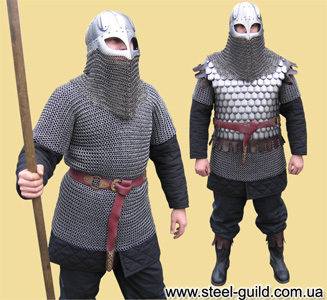 or combined with plate armor or chainmail. Padded armor is usually worn under the plate armor. Padded armor cushions a blow and makes the usage of plate armor more comfortable. Modern gambesons for LARP and SCA, proposed by the most of larp shops, as a rule, consist of two layers of flax or cotton with some layers of wool between them. The Gambeson with four layers of lining protects from the weapon blows used in LARP and SCA, and in combination with plate armor or chainmail can protect the knight from the steel weapon blows. Very often the Gambeson was used for fastening to it different parts of plate armor by means of laces. Also, they could sew to Gambeson some parts of chainmail for protecting those parts of the knight body that were uncovered with plate armor, for example armpits or lower body. 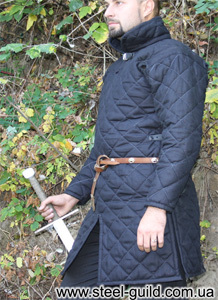 The gambeson is indispensible as Medieval Clothing, it warms up in a cold evening, and also helps to survive the heat. Also, Gambesons are often used on fighter practice. Gambesons make the wearing of plate armor more suitable, and in case of low-quality armor or off-size armor they can minimize the level of discomfort. There is a wide choice of gambesons in our larp shop. No other larp shop can offer such a great variety of models and colours. We offer gambesons of two manufacturers: StahlGilde (2 layers of wool) and gambesons under the Paladin Armoury trademark (4 layers of wool), that is the legend among larpers and an honour of our larp shop. Especially our larp shop is proud of Gambesons from multicoloured flax that looks as it’s just from medieval loom. Just all the gambesons we offer, have special notches for the armpits, which guarantee the knight the complete freedom of movement. Due to natural materials the gambeson has a comfortable microclimate inside. Our gambesons are good ventilated and lets the body to breath. Other kinds of padded armor, such as padded leg greaves,padded stockings, padded bracers and padded gorget are also presented in our larp shop.